Montana’s Home Front During World War II, 2nd ed. The Sioux warrior who is said to have killed Custer glances at a camera from the back of his hooded horse on Page 65. On Page 116 of Gary Glynn’s “Historic Photos of Montana” a toddler sits on a porch in Quigley, the once-booming mining town up Rock Creek. His hand is on a bear cub. The images come rapid-fire, some 200 of them from through the years, with minimal text between: a downhill look at the gritty streets of Walkerville, an open-air passenger car in front of the oldest home in Missoula, the starkness of a sod house on a homestead near Judith Gap. library in Helena to the Library of Congress in Washington. Indeed, the photos celebrate objectivity. There’s something right about Montana in black and white. These aren’t the crystalline lakes, the majestic mountains, the waves of grain painted in living color in the imagination by much of our literary history. These are, most of them, the clothes and expressions we wore, the roads we drove to get to those mountains, the entrails of the Yogo sapphire mine, the Missoulian newsboy-all but lost in a group shot of more than 80 – pointing his own imaginary camera as Roland McKay’s clicks in front of the county courthouse. has published articles in a number of military, aviation and American history magazines and was a regular contributor to the Missoulian’s “Greatest Generation” project during the 50th anniversary of World War II. donated them to the Library of Congress or the university yet,” Glynn said. their glass plates and Kodak Brownies. Another challenge: most of the images Turner and Glynn dug up were taken in western Montana and, specifically, Missoula. Three of the above-named photographers made their homes here. “I tried to put some balance into it and get more photos from eastern Montana,” said Glynn, who grew up in Billings and helps manages his family’s ranch south of Two Dot in the Musselshell country. 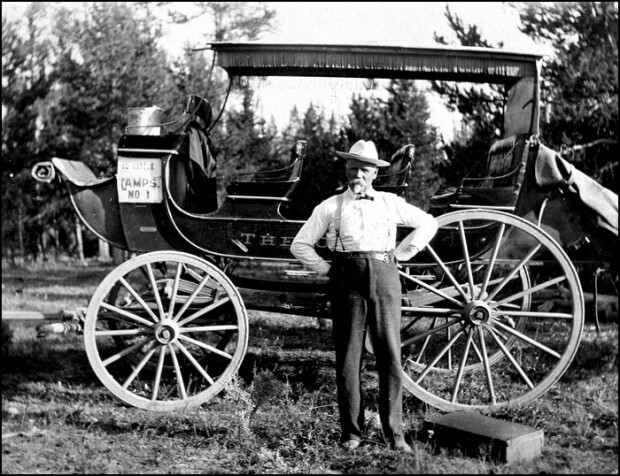 Joseph White Bull helped with that. A nephew of Sitting Bull, White Bull described to a biographer in 1934 the desperate hand-to-hand struggle he had with George Armstrong Custer on the bluff above the Little Big Horn in 1876. According to Stanley Vestal’s interpretation, the struggle ended when White Bull grabbed Custer’s carbine and shot him in the chest. Some 30 years later Boos captured the robust White Bull and two companions on film. Glynn found the image in archives and special collections at UM’s Mansfield Library. 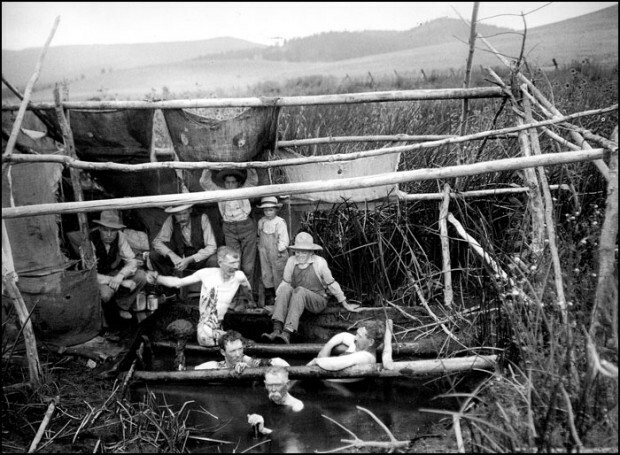 but Dunn’s images of the Missoula area are among the more compelling in the book. 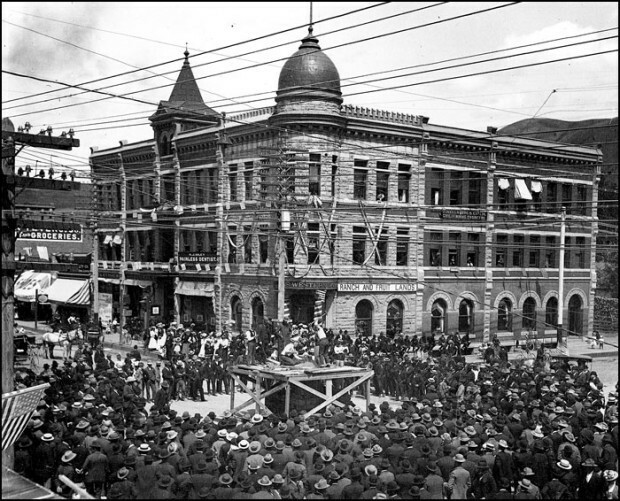 One shows a marching band on East Front Street around 1900, with nothing in the blocks between the band and the wooden courthouse but low hedges and a tall cottonwood tree. Reader’s Digest version of Montana’s history since its territorial beginnings. 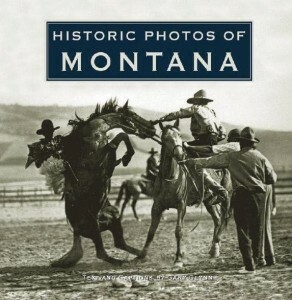 Glynn was at a book signing at Barnes and Noble in Missoula recently when the cover of “Historic Photos of Montana” caught the eye of a passing woman. It’s a photo from the Missoula Stampede, an annual Fourth of July event, taken in about 1940, Glynn said. A bronc rider, black hat intact and chaps a-flying, clings to the vertical back of a rearing horse. A pickup man’s grip on the horse’s bridal and reins is the only thing keeping the animal from tumbling over on top of the cowboy. “That’s my dad,” the lady said, pointing to the rider. “And that’s my uncle,” she said, pointing to the pickup man. 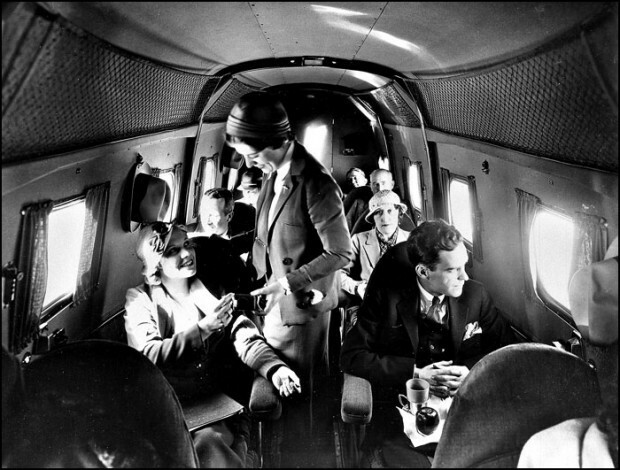 shows passengers aboard an early airliner at the Missoula airport.